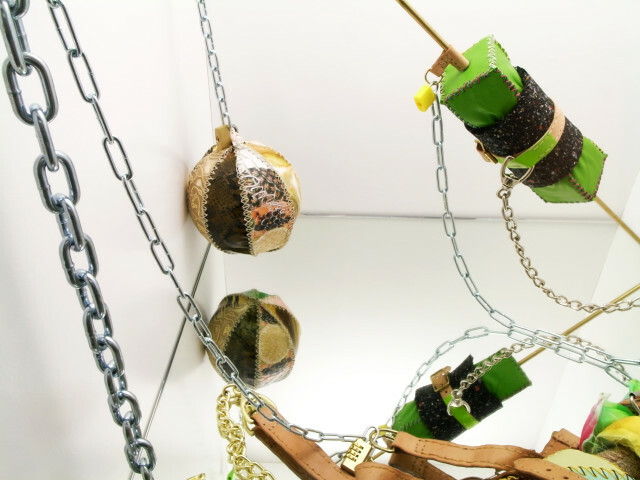 Rattle Clank Jingle Keys Locked plays with tensions; of materials, physically, as opposition and as mental and emotional strain. Tensions are what supports Maiken Bent’s practice; masculinity and femininity, ready-made and craft, the tightness of stitches, chain against skin, bright colours and dark themes. 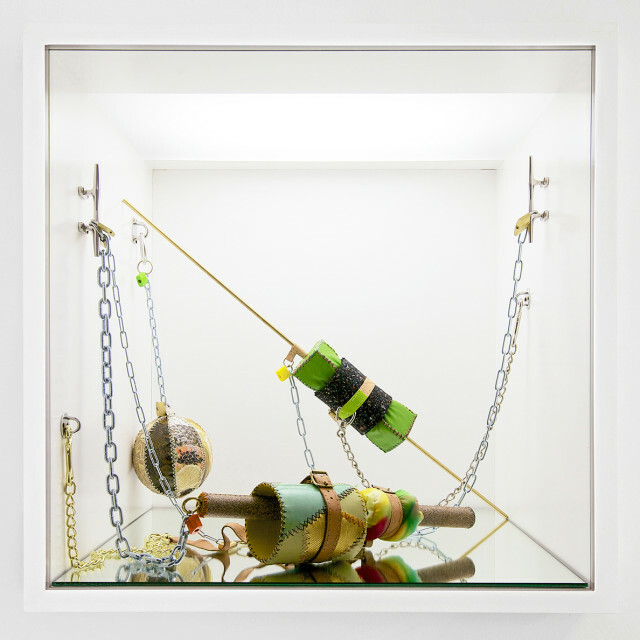 Lures, ropes and hooks perform in two ways, as gadgets belonging to a fisherman or toolbox and as ornamentation that could be found dangling from a luxury handbag. A performance of hunting or DIY is mingling with an attention-seeking appendage. 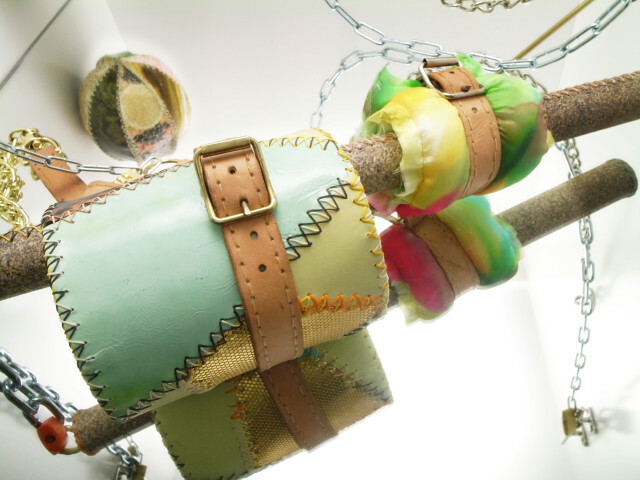 Belts double as decorative and restraining. 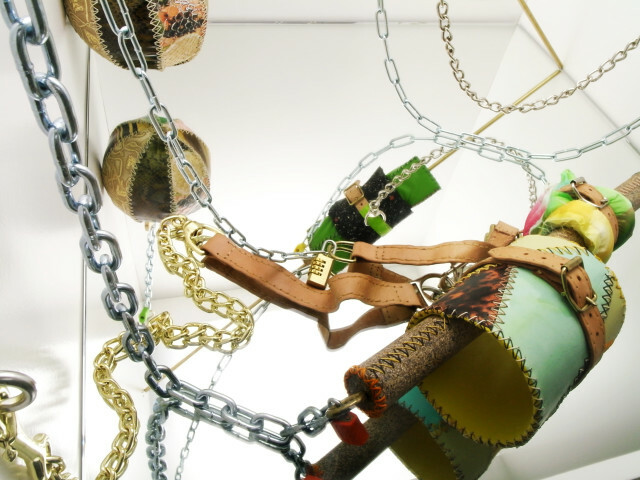 In her series Cargo bungee cords and ties are used to constrain sculptures resembling equipment that would demand an exerting workout. In her solo exhibition at IMO (Copenhagen) in 2009, Bent transformed gallery space into a gym, tugging at a desire for physical interaction. Objects in Rattle Clank Jingle Keys Locked seem purposeful and deviant. The title suggests a struggle and a trap, alluring us into a (mind) game we can’t be sure is fun. Maiken Bent, Denmark,1980 – lives in Copenhagen. Solo exhibitions include; Transatlantique – New Galerie, Paris , Overseas Cargo Club – IMO, Copenhagen , Sense of Echoes – SKMU, Sørlandet Art Museum, Kristiansand , Every Room has a Smell – IMO  & Principles of Pain and Pleasure – Bendixen Contemporary Art , both Copenhagen. Recent group exhibitions include; Out of Fashion, KUNSTEN – Museum of Modern Art Aalborg & Whileaway, Kunsthall Oslo [both 2013]. Bent graduated with an MFA from The Royal Danish Academy of Fine Arts, Copenhagen in 2006.